For many decades this sacred large statue of Dorje Shugden was in Gaden Monastery housed in the Lachi or the large prayer hall. The Lachi has protector chapel containing images of various Dharma protectors of the Gaden Lineage. Within this sacred Chapel this holy Dorje Shugden statue resided together with Mahakala, Kalarupa, Shidak Genye, Yamantaka and Vaisravana. Monks of Gaden Shartse and Gaden Jangtse would do pujas, prayers and rituals in the Lachi daily. Dorje Shugden was one of the prayers done together with the other protectors. Many lay people from the surrounding villages would come daily to make offerings and request prayers in Gaden Lachi. The statue was installed by Kyabje Trijang Rinpoche and Kyabje Zong Rinpoche along with the whole sangha of Gaden happily. 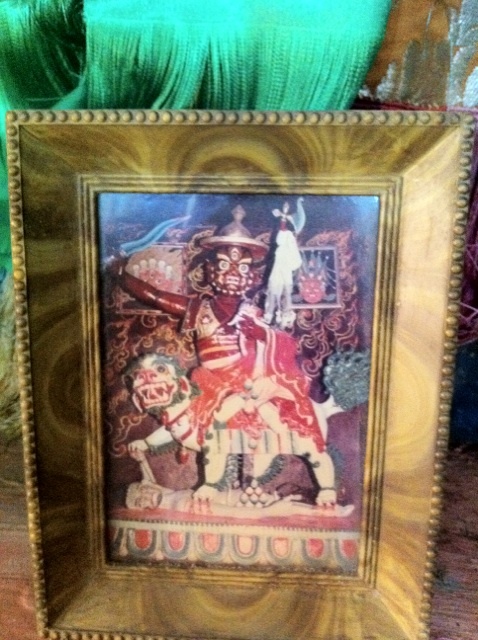 Many sacred relics and mantras were put inside this image of Dorje Shugden. It has been worshipped by the sangha of Gaden, the laity and many visitors for decades. His Holiness Dalai Lama suddenly on one of his visits said this Dorje Shugden statue should not be in the Lachi, but it should be placed in a chapel on it’s own. The elite masters, tulkus, Geshes and over 2,000 sangha of Gaden was confused but nevertheless dare not disobey the command of the Dalai Lama. There was no votes, opinions or room for debate with the Dalai Lama. The Dalai Lama ‘s orders had to be carried out without question even if you have questions. The object of veneration for many highly realized beings, erudite scholars and senior monks of Gaden was suddenly ‘wrong’ and the Dalai Lama’s sole opinion was right. No one dare speak up. It would be tantamount to some type of treason. Now this holy statue is still in Gaden in it’s own chapel worshipped by many. But how it came to be on a chapel of it’s own still perplexes the many masters of Gaden who have no choice but to carry out the orders of His Holiness the Dalai Lama. Everything is ‘democratic’ except the will of the Dalai Lama in old Tibet and in exile. Whatever the case, hundreds still go to make offerings to this very sacred and old statue of Dorje Shugden that has granted the wishes of many. If you have a chance, you should visit this Dorje Shugden with sincerity in your heart. Your obstacles can be cleared too. This entry was posted on Tuesday, December 20th, 2011 at 1:43 pm	and is filed under News. You can follow any responses to this entry through the RSS 2.0 feed. You can leave a response, or trackback from your own site. Die INFOS zur SELBSTHILFE zum Thema “Selbsttherapie Ängste” auf dieser Webpage von Youtube haben mir wirklich extrem viel weitergeholfen.